Professor Paul Maharg is a leading scholar in legal education, where his work is currently focused on interdisciplinary educational innovation, the design of regulation in legal education and the use of technology-enhanced learning at all levels of legal learning. At ANU, he is Director of the PEARL centre (Profession, Education and Regulation in Law). Paul has worked with regulators in Scotland, England, Hong Kong and Australia to improve the regulation of legal education, and recently co-authored influential reports into the regulation of legal services education in England and Wales, and in Hong Kong. With degrees in the Arts as well as Law and Education, he also explores the relations between law & literature, particularly in the context of Scots culture, history and law. He has authored or edited four books on legal education and is the founder and co-editor of two book series, Emerging Legal Education and Digital Games and Learning, and co-editor of the European Journal of Law and Technology. He is a Fellow of the Royal Society of Arts (2009), is a UK Higher Education Academy (HEA) National Teaching Fellow (2011), and a Principal Fellow of the HEA (2015). He holds a Visiting Professorship at Hong Kong University Faculty of Law, an Adjunct Professorship at Griffith Law School, and is part-time Professor of Law, Nottingham Law School. Australian National University: 2013-present, Professor of Law. Northumbria Law School: 2010-2013, Professor of Legal Education. Strathclyde University: 1999-2010, Senior Lecturer then Professor of Law. Glasgow Caledonian University: 1992-1998, Lecturer then Senior Lecturer. Professor Paul Maharg heads up our newest research Centre, the PEARL (Profession, Education and Regulation in Law) Collaborative. Professor Paul Maharg is a leading scholar in legal education, where his work is currently focused on interdisciplinary educational innovation, the design of regulation in legal education and the use of technology-enhanced learning at all levels of legal learning. 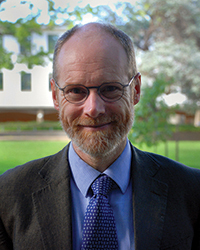 At ANU, he is Director of the PEARL centre (Profession, Education and Regulation in Law). Paul has worked with regulators in Scotland, England, Hong Kong and Australia to improve the regulation of legal education, and recently co-authored influential reports into the regulation of legal services education in England and Wales, and in Hong Kong. With degrees in the Arts as well as Law and Education, he also explores the relations between law & literature, particularly in the context of Scots culture, history and law. He has authored or edited four books on legal education and is the founder and co-editor of two book series, Emerging Legal Education and Digital Games and Learning, and co-editor of the European Journal of Law and Technology. He is a Fellow of the Royal Society of Arts (2009), is a UK Higher Education Academy (HEA) National Teaching Fellow (2011), and a Principal Fellow of the HEA (2015). He holds a Visiting Professorship at Hong Kong University Faculty of Law, an Adjunct Professorship at Griffith Law School, and is part-time Professor of Law, Nottingham Law School. The four lozenges to the left are (very) brief summaries of what I believe the research from a number of jurisdictions globally is telling us about what needs to be improved in legal education. The four corresponding texts are my attempts, to date, to explore my responses and those of other educators to the issues. The four sets of issues and approaches are not fixed: they are fluid, in constant tension, often against each other, and nearly always over against prevailing forms of legal education. As a counter-culture, they can be transformational in their effects on legal education. The four sets of issues and approaches, though, do not represent anything as fixed as a general programme for reform -- that's rarely applicable to specific local circumstances. If we are to take the lessons of situationists, phenomenographers and Pragmatists, we should perhaps advocate methods rather than plans, knowing that the outcomes will be different in almost every implementation.